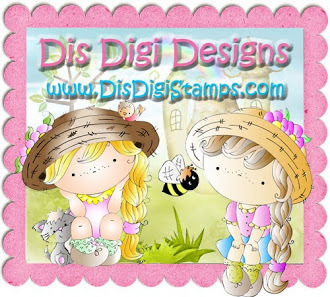 This is my last design team card for Addicted to Stamps & More as I am stepping down at the end of June. I want to thank Kylie for giving me the opportunity to be a part of this wonderful challenge blog. And I want to thank Caz, Danielle, Deepti, Florence, Monika, Nonni, Sandie, Shana, Sue and Kylie for their support - I've really enjoyed being part of this creative and fun team! I hope I have inspired you to join us for this fun challenge. Be sure to check out the fabulous designs from the Design Team at ATS&M! Who could help but have a sweet day after seeing this! Sweet! Love the color combo and the little shoes and the strawberry plant! Way too cute. Hugs. Awe, she is adorable! I love the rosy cheeks and the glossy strawberries. Great additions to make it just perfect! Sweet card Loll, wonderful job coloring with your copics, and she looks so cute with the rosy cheeks! 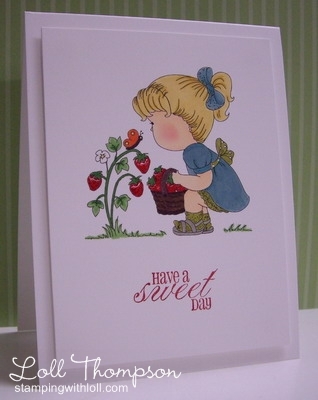 OMG Loll your little strawberry picker is SO Sweet and beautifully colored. I love how you used chalk for her pink cheeks and kept your layout CAS. TFS and being a part of the wonderful DT. Oh Loll this is just the sweetest image and you've colored it so perfectly (love those rosy cheeks). The strawberries do look yummy. Those strawberries do look super yummy! Such a sweet image and a cute card. I always enjoy visiting your blog and really like your positive spirit that I can feel although we have never met. I'll not say goodbyes because I'll keep visiting here but I'll say thanks for being such an inspirational DT member! Hugs! A perfect card to end on. This really is so sweet. The colouring so detailed, I love her hair and dress bow! It has been great being on the DT with you but I am subscribed to you and will continue to be inspired by you. And I believe it is a special day tomorrow???? 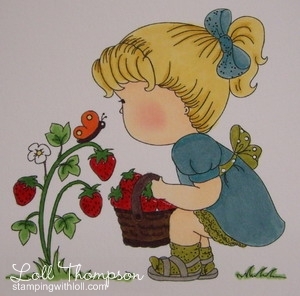 This is gorgeous Loll - love your colouring and those strawberries look good enough to eat! Sorry to hear you're stepping down from ATS&M but hope you're continuing on A2CAS? Hope you have a wonderful day tomorrow. I love how you colored this darling image...this is such a precious card!!! I'm sorry, I didn't realize you are having a birthday... I hope you have a wonderful day and that all of your birthday wishes come true!!! Thank you so much for your inspiration...your cards are gorgeous! Beautiful card Loll. There seems to be a lot of strawberries appearing, craftwise, at the moment. Loooovely!!! I will miss you at ATS&M :( Have a great week. P.S. Hope you enjoyed your meal!